It's unclear still if "Interiors" is the name of the first single to be released or the name of the actual album itself, but either way we are excited. In July the band was asked if it was true that they were working on new material, frontman Walter Schreifels responded, "Can't confirm or deny." Quicksand originally broke up as a band back in 1995 at a high point in their musical success. The band reunited briefly in 1998 for a show in February in Japan and later that same year went into the studio to begin recording material written in the prior six months. Quicksand then returned to the studio again in 1999 after a North American tour with Deftones to continue working on the new album; despite the successful tour and a more collaborative effort in the writing process, tensions resurfaced that would eventually split up the band indefinitely in late 1999 and doom the material to remain officially unreleased. Since then however the unfinished album, as well as demo material from the "Manic Compression" sessions, has since been circulated on the internet. Quicksand reunited a few times since then for special appearances and tours. Their most recent time together on stage was last July at Taste of Chaos: The Festival in San Bernardino, CA. Be sure to stay connected with us at TandA Media for more news and coverage to come on QUICKSAND. Today, I Prevail premiered their latest video for the title track off their 2016 album "Lifelines." 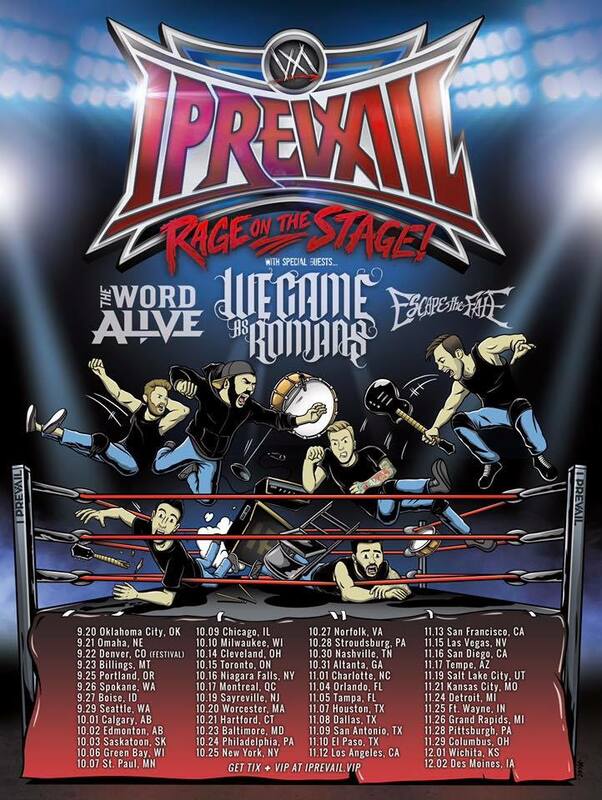 Along with the video the band promoted the giveaway they are currently hosting or their upcoming headlining tour this Fall with The Word Alive, We Came As Romans and Escape The Fate. The band is awarding (1) winner + guest will fly to their show in NYC on 10/25 + receive VIP tickets/hotel/dinner. To enter, go to the bands Facebook post of the video and share and comment. Don't skip out on this awesome opportunity! Be sure to stay connected with us at TandA Media for more news and coverage to come on I PREVAIL. Slightly Stoopid have raised over $20,000 for charity through a successful artwork auction. As we shared last month, the band released a beautiful video for their song "One Bright Day" featuring singer/songwriter Angela Hunte, off of their most current album release, "Meanwhile … Back at the Lab." The video is comprised of animated stills procured from large canvas paintings donated by Hawaii-based artist and aspiring pro-surfer Danielle Zirk. Six original signed and numbered hand painted canvasses featured in the video were auctioned off allowing fans to own a piece of Slightly Stoopid history. Proceeds from the auction will benefit The Global BrightLight Foundation (GBL), a nonprofit that provides affordable solar energy solutions to rural and impoverished communities globally. Selected stills were also collected and are going to be featured at Hard Rock International venues. “Adding these original pieces of art to our collection will allow us to represent the undeniable connection that exists between art and music,” says Jerry Fraize, Director Of Memorabilia and Hard Rock International spokesperson. “Our guests are sure to enjoy these original paintings, and the message they convey for years to come." Global BrightLight is not the only organization Slightly Stoopid has supported this year. The band also regularly partners with many cancer fighting organizations such as Grind For Life (grindforlife.org), a nonprofit started by competitive skateboarder Mike Rogers , and Candlelighters (candlelightersoregon.org) which focuses on battling pediatric cancer. Earlier this year, Slightly Stoopid raised over $30,000 for pediatric cancer research by collaborating with pro-skater Danny Way to release an exclusive album along with a limited edition run of 1,000 skateboards. Take a listen to Slightly Stoopid's latest release, "One Bright Day" and enjoy the beautiful visuals that accompanying it. Be sure to stay connected with us at TandA Media for more news and coverage to come on SLIGHTLY STOOPID. Today, The Used have posted a teaser to some new tunes coming Monday 08/21. The band posted a link on Facebook earlier directing traffic to their website. Once there, fans see a reel-to-reel player that instructs you to "Press Play." The player then plays a sample of their hit songs that you can shuffle through when you hit fast forward. If you hit the button enough, a track will eventually pop up that doesn't appear to have a title and is hard to make out what you're hearing, thats the sneak peek. Last week vocalist Bert McCracken and guitarist Justin Shekoski played a special acoustic set in Huntington Beach, CA and broke the news that a new album is coming and the full band will be hitting the road for a tour in October and November, dates or tour has not yet been officially confirmed just yet. Be sure to stay connected with us for more news and coverage to come on THE USED.